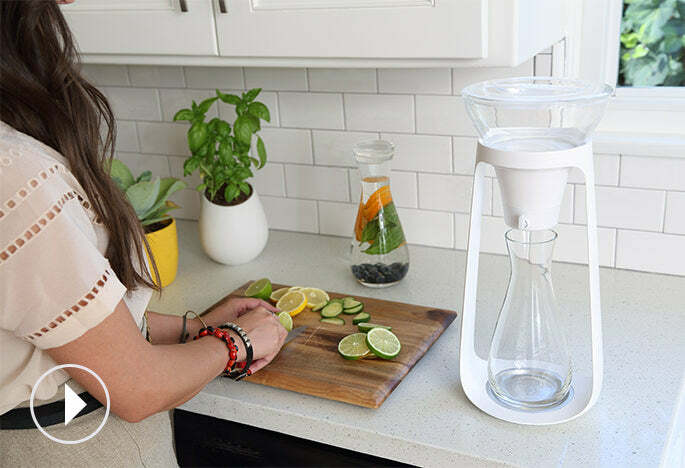 Water Fall by KOR is a beautiful at home filtered water hydration system. Inspired by the artisanal pour-over coffee method, Water Fall creates pure, great-tasting water for your daily hydration needs. Unlike a filtered pitcher, Water Fall separates the filter from the carafe, allowing you to filter water into multiple carafes. * Please Note: Promotional/Discount Codes cannot be used on subscriptions. Inspired by the artisanal pour-over coffee method, Water Fall creates pure, great-tasting water for your daily hydration needs. Unlike a filtered pitcher, Water Fall separates the filter from the carafe, allowing you to filter water into multiple carafes. Water Fall’s innovative design uses long-lasting, eco-friendly filters to ensure crystal clear water that tastes delicious. The filter and carafe are separate which allows you to have multiple glass carafes of great-tasting water whenever. Plus, our coconut shell filters purify your water in natural and sustainable way. Includes: 1 stand, 1 filter and 2 beautiful glass carafes with caps. Water Fall’s unique, patented filtration process uses a natural, coconut shell filter that’s completely sustainable and transforms ordinary tap water into pure, clean KOR Water. Each filter produces up to 80 gallons, which lasts up to 4 months (that’s 1280 glasses of water)! While our coconut shell filter already makes water amazing KOR Water, the glass carafes let you get even more creative. Add fresh fruits, veggies and herbs for a naturally refreshing twist on hydration. The options are truly endless. Just like its natural namesake, Water Fall is simple yet stunning to look at. The minimal, clean design and shapely, glass carafes look great on the table and your countertop. Plus, they take up less space in the fridge. A hydration system, not just a filtered pitcher. Filter as much KOR Water, in as many carafes as you want. Water Fall includes two glass carafes and filter. Add additional carafes and filters to fit your hydration needs. See Water Fall in action. Learn more about the inspiration behind this revolutionary home hydration system and how it works.